Hello, my name’s Lexxi. 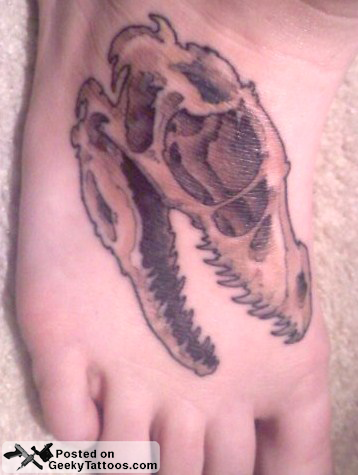 My geeky tattoo is of a velociraptor skull. I saw the brontosaurus and just had to submit my dino tattoo! I got this because I loved velociraptors as a child and wanted to commemorate that with a tattoo. For the longest time when I was younger I wanted to work as a paleontologist. I’m planning on getting another skull on my other foot. Tattoo was done at PussyKat Parlor Tattoo in Las Vegas, NV by Brett. Tagged with dinosaur, foot, PussyKat Parlor, velociraptor.